It's a purely simple solution for sharing some perfectly simple enjoyment around a fire. 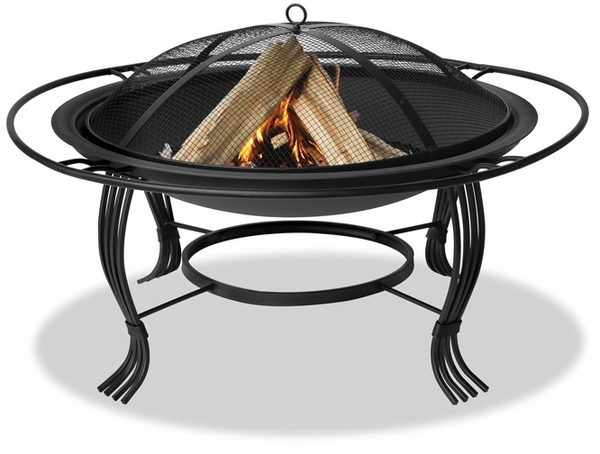 This black finished fire pit holds up to four logs at a time and can be assembled quickly for use at any event. It is appproximately 34.6" in diameter by 19.3" high. It includes an outer ring and a matching black spark guard to help protect all your favorite fire lovers from that unexpected flying spark. Also a limited one-year warranty is included. What is the total weight of it is in the package? What are the dimensions of it? This particular kit weighs 19 pounds and has a package that measures 38 inches in length and width, by 8 inches in depth. Is the fire bowl 34 inches in diameter, or is it the surrounding ring that is 34 inches? Per the manufacturer, 34.6" is indeed the diameter of the outer ring. The fire pit itself has a diameter of 30". Excellent Fire Pit for the Money! Easy to assemble, lightweight, and works like a champ.